Thanksgiving is just around the corner, and the grocery stores are chock full of frozen birds and holiday hams ready for the eating. At its surface, Thanksgiving seems like a veritable "glutenfest". Many traditional Thanksgiving recipes are laden with gluten, but does that mean those of us with celiac disease are doomed to eat our crumbly gluten free bread and dry turkey off in a corner? Not at all. When thinking about a holiday menu, there are the traditional "go to" items- green bean casserole, stuffing, mashed potatoes with gravy, sweet potatoes, cranberry sauce that slithers out of the can, pumpkin pie, and of course turkey. I have made gluten free and dairy free versions of these family favorites in the past, and they have been quite flavorful. This year for Thanksgiving though, I am departing slightly from the traditional sides and lightening things up a bit. But isn't Thanksgiving all about over-indulging you ask? Watching football on the living room TV in a turkey and stuffing-induced food coma? Stuffing, turkey, cranberries, potatoes, and pumpkin will all make an appearance, but this time be a little simpler, a little cleaner. For me, it is less about the extra calories (although being able to wear skinny jeans all holiday season long is a bonus) and more about extra time out of the kitchen and available to spend with loved ones. So, if you are looking to change-up your Thanksgiving menu a bit, give some of these recipes a try. These items are all high on flavor with minimal effort. The turkey, potatoes, and brussel sprouts are simply oven-roasted, while the cranberries and pumpkin cheesecake can be prepared the day before. Do remember to choose wisely when looking for your turkey. While turkey is inherently gluten free, many companies inject flavorings and solutions that may contain gluten. Honeysuckle White, Jennie-O, Perdue, and Riverside (sold at Walmart) are all brands that have gluten free turkey products. While not labeling their turkeys as gluten free, Butterball's website does list the only two products within their turkey product line that contain gluten. As always, check labels and opt for making your own gravy, as gravy packets that accompany turkeys typically contain gluten. After cleaning the bird, I simply salt and pepper it and stuff the cavity with onion, garlic, fresh herbs and bay leaf. Follow appropriate roasting directions on packaging, since roasting times vary depending upon the size of the bird. These are nothing like the boiled brussel sprouts you secretly spit out under the dinner table as a kid. So simple to make too. The oven roasting and balsamic vinegar give these balsamic glazed brussel sprouts another dimension and added elegance. Don't judge until you try them. I adapted Ina Garten's recipe for Herb and Apple stuffing, using gluten free and dairy free substitutions for the bread (Udi's or Deerfield's french baguettes work well), butter (Earth Balance), and chicken stock (Pacific Food, Kitchen Basics, or Rachael Ray's). I also added a pound of chopped sausage. Applegate Farms sage sausage or Al Fresco Chicken and Apple sausage are two great, gluten free varieties to try. Similar to the brussel sprouts, these potatoes take on a whole new taste when oven roasted. 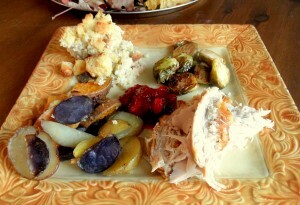 I sliced them thin and mixed in a variety of potatoes for added elegance: red, purple, fingerling, and sweet potatoes. Toss them with a few teaspoons of sea salt, 2-3 tablespoons of olive oil, a few springs of rosemary, and roast them in a 400 degree oven for 50-60 minutes. Another easy recipe with a twist. Simply follow package directions for simple cranberry relish: 1 12 ounce package of fresh cranberries , 1 cup of water, and 1 cup of sugar. Boil water and sugar mixture, adding cranberries and stirring until they pop. I embellish mine with golden raisins, chopped pecans, and a few dashes of cinnamon and nutmeg. So excited to have this! I just started going Gluten Free to see how it affected my stomach and it's like a miracle. I was worried about Thanksgiving -- no more! Happy holidays! Glad to hear you are feeling better without the gluten. It can make a huge difference, and you'll soon find there is plenty you can still eat and enjoy. Have a great holiday, and I look forward to sharing more recipes with you!